Schizophyllum commune, a basidiomycetous fungus, is a common invader of rotten wood. This fungus rarely causes mycotic disease in humans, especially cutaneous infection. In this paper, we describe the first case of cutaneous granuloma caused by S. commune in a Chinese woman. A 25-year-old female with a two-year history of erythema, papules, nodules, and scales on her sole of left foot was presented to our outpatient center. Samples were obtained by the scraping of lesion and for light microscopy. Hyphae were observed by microscopic examination. We carried out a skin tissue biopsy, which showed multiple granulomatous nodules. Biopsy specimens were also inoculated onto media. After being cultured on SDA at 27 °C for 7 days, spreading-woolly-white colonies grew on the inoculation sites of media containing chloramphenicol only and there,s no other colonies grew. S. commune was identified by morphology methods, biochemical tests, and PCR sequencing. Pathological findings also aided in diagnosing cutaneous fungal granuloma. Oral itraconazole was applied. After 1 month of therapy, rashes on her left foot and pain were improved. 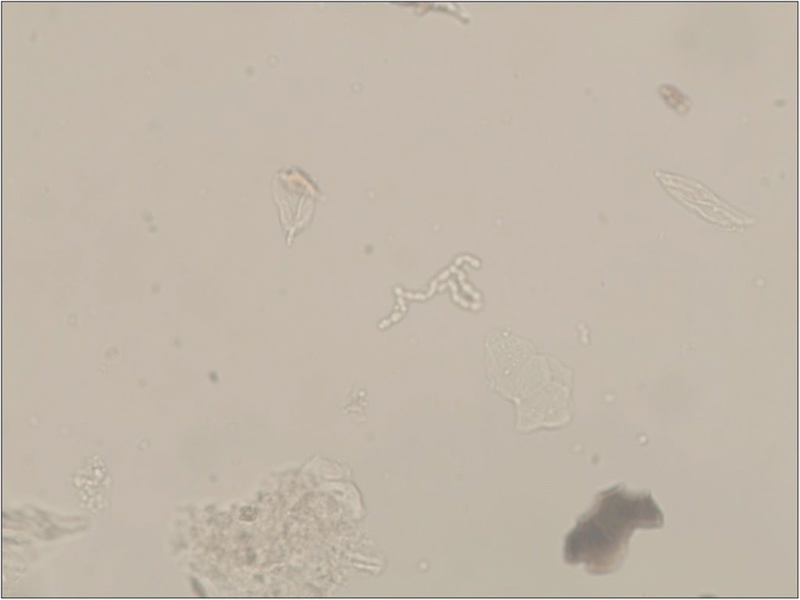 We describe the first case of cutaneous granuloma caused by Schizophyllum commune, which illustrates the importance of recognizing uncommon pathogenic fungal infections. Schizophyllum commune is a common fungal species, which belongs to Eukaryota, Opisthokonta, Fungi, Dikarya, Basidiomycota, Agaricomycotina, Agaricomycetes, Agaricomycetidae, Agaricales, Schizophyllaceae, Schizophyllum. This fungus colonizes diverse trees and rotting woods worldwide [1–3]. S. commune has also long been regarded as nonpathogenic to humans [4, 5]. Recently, an increasing number of cases related to S. commune infection has been reported. Most reports are associated with allergic bronchopulmonary mycosis (ABPM) after inhaling the spores of S. commune [1, 2, 6]. Infection in deep tissues, such as the sphenoid sinus, maxillary sinus, and brain, has also been recently reported [2, 7–9]. To our knowledge, the cutaneous infection caused by S. commune has not been reported yet. A 25-year-old female with a two-year history of erythema, papules, nodules, and scales on her sole of left foot was presented to our outpatient center. She has no history of autoimmue disease and untreated with immunosuppressive therapy. Considering her pregnancy, she was not given treatments for 1 year. The left foot skin lesion on the medial and lateral margins and on the fourth toe dorsum became enlarged with evident pain after more than 1 year (Fig. 1a and b). Approximately 1 month before visiting our department, she received treatment ineffectively in a local clinic, and the diagnosis was unclear. Samples were obtained by the scraping of lesion and for light microscopy. Hyphae were observed by microscopic examination (Fig. 2). We carried out a skin tissue biopsy, which showed multiple granulomatous nodules (Fig. 3a). The Ziehl–Neelsen stain was negative. Periodic acid–Schiff (PAS) and Grocott methenamine silver (GMS) staining were carried out two times. Results were also negative. Biopsy specimens were also inoculated onto two kinds of media: Sabouraud’s dextrose agar (SDA), where one of which contained chloramphenicol and cycloheximide, and the other one contained chloramphenicol only. After being cultured on SDA at 27 °C for 7 days, spreading-woolly-white colonies grew on the inoculation sites of media containing chloramphenicol only and there,s no other colonies grew (Fig. 3b). The colonies produced an unpleasant smell like biogas. No colony was observed on the media with chloramphenicol and cycloheximide. 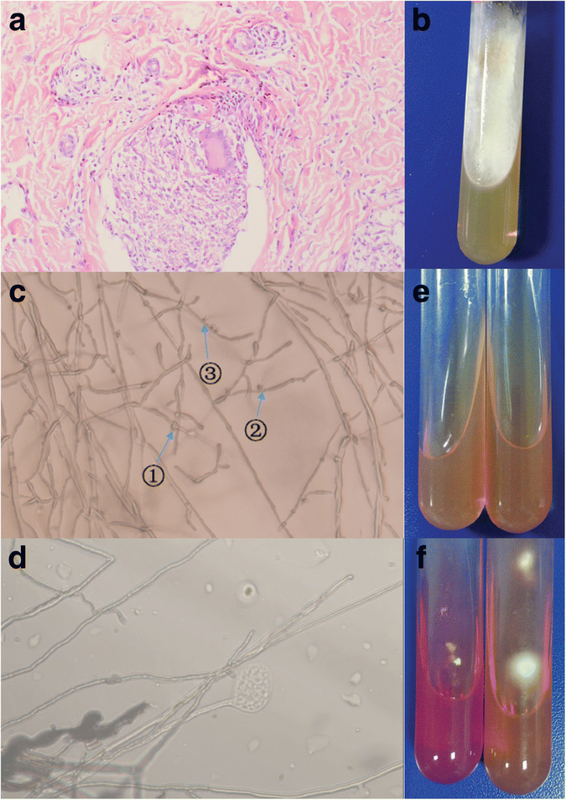 Clamp connections, spicules, tear-like secretions, and medusa-like isomers were observed on the slide culture at 27 °C after 3 days (Fig. 3c and d). Urease activity tests were also performed. Trichophyton rubrum standard strain and the isolated strain were cultured on urease media at 27 °C for 7 days. The T. rubrum standard strain was negative, whereas the isolated strain turned red (Fig. 3e and f). Sequencing of large subunit rDNA was performed by using the E.Z.N.A.™ Fungal DNA Mini Kit (Omega Biotek, USA). We utilized set primers for the region of internal transcribed spacer (ITS) and performed PCR. The PCR primers were ITS1: 5′-TCCGTAGGTGAACCTGCGG-3′ and ITS4: 5′-TCCTCCGCTTATTGATATGC-3′. The PCR-amplified DNA was matched with that of S. commune (Nos. KP 326677.1 and KP 004975.1) with a homology of 100%. After identification, the sequence was submitted to the GenBank (MF 495704). Pathological finding and mycological examination indicated a cutaneous granuloma caused by S. commune. Oral itraconazole (100 mg) was applied twice a day. The rashes on the left foot and the pain regressed after 1 month of treatment (Fig. 1c and d). Follow-up is currently under way. To our knowledge, fungal granuloma is caused by a wide variety of fungi, such as Coccidioides, Histoplasma, Blastomyces, Cryptococcus, T. rubrum, and T. mentagraphytes, but some less known fungi have been recently documented as causes of fungal granuloma . In the past, S. commune was regarded as a rare human pathogen. Since 1950 when Kligman reported the first case of onychomycosis caused by S. commune, this fungus has emerged as an increasingly important pathogen for clinical disease . We conducted a literature review through PubMed and found that S. commune is an opportunistic pathogenic fungus that can cause sinusitis and ABPM mostly [3, 12], as well as rarely isolated from patients with onychomycosis, palate ulceration [11, 13]. Table 1 shows the clinical spectrum of fungal disease caused by S. commune and country-wise distribution of clinical cases. Cutaneous and subcutaneous infections caused by S. commune have not been previously reported. In our case, colonies grew on the inoculation sites of media with no other colonies grew and antifungal therapy only was effective, which can be excluded the possibility of contamination. We describe the first case of cutaneous granuloma caused by S. commune, which illustrates the importance of recognizing uncommon pathogenic fungal infections. Lidi Tian and Yunzhu Mu contributed equally to this work. We thank Prof. Lin Wang from West China Hospital of Sichuan University for pathologic diagnosis assistance. This work was supported by local city-school cooperation project (NSMC20170418) and the Project Q15005 of Youth innovation in medical research of Sichuan Province. LT and YM conceptualized, collected and interpreted the clinical data, and wrote the manuscript. HZ designed, interpreted the clinical data and wrote the manuscript. XcS, CY, and XzS revised the manuscript critically for important content. DQ carried out the microbiological examination and nucleotide sequencing. All authors read and approved the final manuscript. Written informed consent was obtained from the individual patient described in this report. A copy of the written consent is available by request.